This novel independent disc idea is an informal collection of home movies made by monster fanatics, kids weaned on creepshow matinees and Forry Ackerman's Famous Monsters magazine. There were monster crazy kids in every class in school, and Savant remembers fondly how fellow third grader Arthur Gaitan filled me in on essential Universal lore back in 1961 or so; it was important to know how each monster was dispatched at the end of every movie and how he came back in the next one. There was always one enviable kid with bragging rights -- he had parents or an older sibling who would take him to movies our parents wouldn't allow the rest of us to attend! The Monster Kid Home Movies disc is a hoot. Producer Joe Busam has lined up 30 mini-epics from twelve pint-sized auteurs, who appear to be making these shows from age eight up to high school. Some are little more than dress-up and prance-about pictures, while others are the secret work of ambitious tykes galvanized by the creative ability to play with film. Some kids wear masks while others appear to be in costumes made by parents; but many of the pictures represent wholly kid-generated fantasies that came about when one fanatic found a like soul in cinematic crime, or someone at least willing to hold a camera (steadily, sometimes) or become an actor. How many of us have epics like this hidden up in the back of a closet? Savant never had the guts to show his filmic efforts to his wife or his kids, even though I kept up the fun right into early college days. It's funny how doing one's own silly comedies didn't turn out to be an asset in film school! Joe Busam is no coward, he's right in there with his own work, proudly playing the hero of a living-room version of The Raven with a title bird made from an old sock. He's enticed a number of film and arts notables to contribute. Makeup man and collector Bob Burns provides sort of an ancient-origins opening with a pair of early 1950s monster shows in B&W, complete with electric rays scratched into the film with a needle. Eight millimeter was tiny stuff and I always wonder what kind of damage I did to my young eyes poring over a tape splicer for hours on end. Other efforts come from Kerry Gammill, now a graphics and comics artist, Frank Dietz, now a Disney animator and filmmaker Robert Tinnell. Author and frequent disc commentator Tom Weaver is also in on the fun. Each entry is accompanied by a short text card explaining who the filmmaker is and what became of him. They all sound like great guys we wished lived in our neighborhood when we were young. Presentation is everything and PPS' disc is professional in all respects. A humorous and easy to follow menu system starts with a graphic that suddenly chatters like a splicey 8mm film going through a projector. Each show can be viewed with a music soundtrack, or a projector noise track, or accompanied by the comments of the filmmaker. These personal audio reminiscences are wonderful, providing the necessary backstory to let us appreciate the amateur circumstances of production. Most of the comment is affectionately self-mocking, pointing up obvious goofs and things like their surprise at seeing the colors in the old living rooms where they grew up. Video Watchdog's Tim Lucas and screenwriter Tom Abrams provide a commentary for a pair of teen films he inherited from the late Alan and Mark Upchurch, names familiar to readers of the magazine. The disc has a nice blend of kiddie silliness and budding talent. For every 'dress up' movie there's a serious work by someone like Frank Dietz, who experiments with clay variations on Ray Harryhausen's Rhedosaurus and Cyclops. And they're not bad, either. Each entry plays with a little 8mm leader (with a splotchy red-ink stripe) to remind us of the home movie experience. The transfers are excellent. With only a couple of jumpy splices here and there, all are in terrific shape, sharp, clear, colorful and free of scratches ... can't make that claim about my films. Audio quality and menu navigation are all-pro. 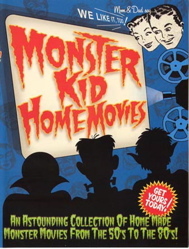 Unlike many well-known lesser DVD labels, Monster Kid Home Movies plays like a high-end disc. A cute insert allows one to make a folding toy version of the cardboard-box monster from one of the backyard epics. The PPS group gives this website to order the disc, which I believe also shows up in an ad in the lastest issue (ish, in monster magazine collector argot) of VW. Savant has no personal or business association with the makers of the disc.